Undetectable French lace center, durable super thin skin perimeter, easy to use and maintain. Good for first time user. Stock hairpieces, instant delivery. Our LS1 stock men's hairpiece is made with soft French lace in the center and durable super thin skin along the perimeter. The design of the base is easy to maintain and very suitable for first-time wearers of a hair piece. 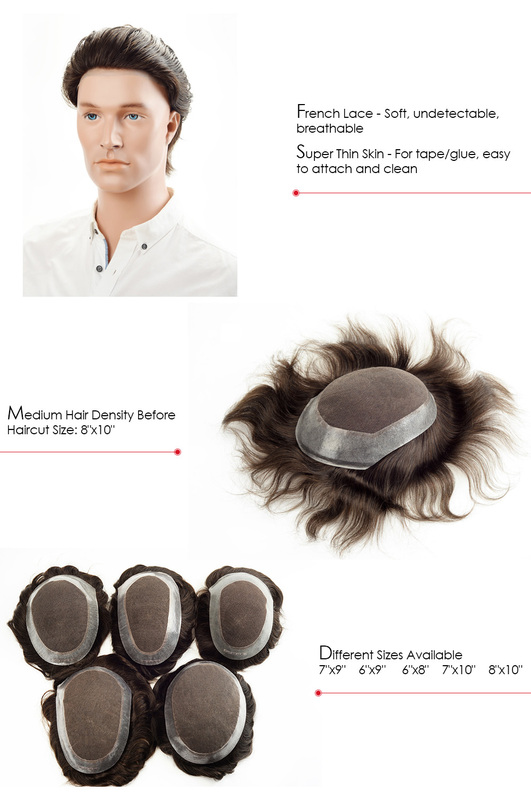 Capable of holding a medium density, this French lace skin hairpiece for men is also breathable which allows heat and moisture to escape and helps your head remain cooler during hot weather or intense physical activity. If you are looking for durable and breathable French lace hair piece (thin skin), then LS1 stock hair piece is the perfect choice. The base sizes of this hair piece for men are available in 6''x8'', 6''x 9'', 7''x9'', 7''x10'' and 8"x10". This hair system can be cut down to your actual size by cut-in and styling with a small additional cost. The cut & ready hair system will only take 3 additional business days! Furthermore, we also ensure immediate shipment so that your amazing hairpiece reaches you in less than a week. 6''x8'', 6''x 9'', 7''x9'', 7''x10'' and 8"x10"
Besides top-quality custom hair replacement systems, stock men’s hairpieces, and ready-to-wear wigs, Lordhair also provide top-notch hair cutting and styling service at small additional cost of $20 USD. The best part is that it only takes 3 additional business days to get it done. You just need to send the pictures of hairstyle you like, or choose one from the pictures below. For best hair transformation results from French lace thin skin hair piece or any other hair system, please provide the hair length you prefer after cutting.